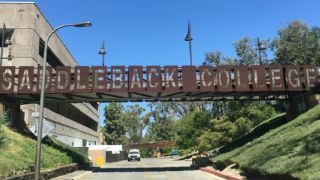 Why is Saddleback College Seeing Such Significant Projector ROI? When it comes time for Saddleback College to update projectors, there’s nothing more effective than a side-by-side comparison. When Dana Manley, Computer AV Technician for Saddleback College, needed a new set of projectors for the college he would line up each model side by side and eliminate the “losers” until he found his winner. Five years ago, his director noticed Hitachi always won and declared the school an all-Hitachi campus. It hasn’t changed since, thanks to Hitachi projectors’ brightness, competitive pricing, reliability and ease of use. This California college has a student population of 30,000 and offers several different types of classrooms throughout the campus. Dana Manley handles everything AV-related for the school. It’s his job to visit every classroom, assessing technological needs and specifying solutions. He’s determined that there are five different types of classrooms, meaning five different scenarios he has to prepare for. Each type of room needs different equipment, some rooms need a document camera and others need extra computer hook-ups. As for the brand of the projectors, Manley always knows in advance. Manley decided to register in the OneVision program when he heard about the great incentives from sales representative Edgar Jimenez. “Edgar told us about the program incentives and we were sold,” says Manley. “We get an extended warranty and either a free lamp or projector when you buy 10 projectors. We like to buy extra projectors to have just in case anyway, so why wouldn’t we sign up?” Manley explained that the extended warranty is the best part of the program for Saddleback because the warranty lasts longer than the school’s refresh cycle, meaning that the projectors are always covered while in use. Overall, the quality of the product and the service from Hitachi has changed Saddleback College’s AV technology. Even the departments that Manley doesn’t directly have a hand in are converting to Hitachi at the next refresh.